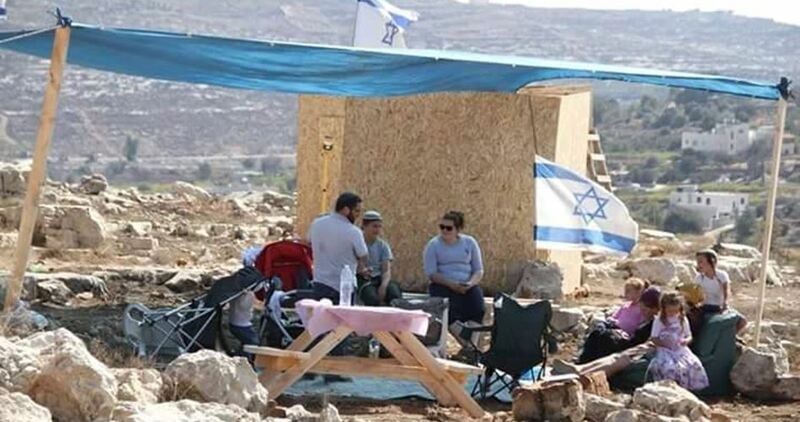 Hebrew media sources on Sunday revealed that a group of Israeli settlers over the past few days have established a new settlement outpost near Nablus city. Hebrew TV channel 20 reported that a number of Israeli youths about three weeks ago set up a new outpost near Itamar settlement southeast of Nablus. The media sources claimed that the Israeli authorities tried to remove the outpost because it was not approved by the Israeli government. Israeli settlements in the occupied West Bank are illegal to the international community whether established with or without the approval of the Israeli government because they threaten the peace process and the two-state solution. There are over 700,000 Israeli settlers in the West Bank, including Jerusalem, which is inhabited by more than 3 million Palestinians. Their presence has been a source of tension in the region since 1967. 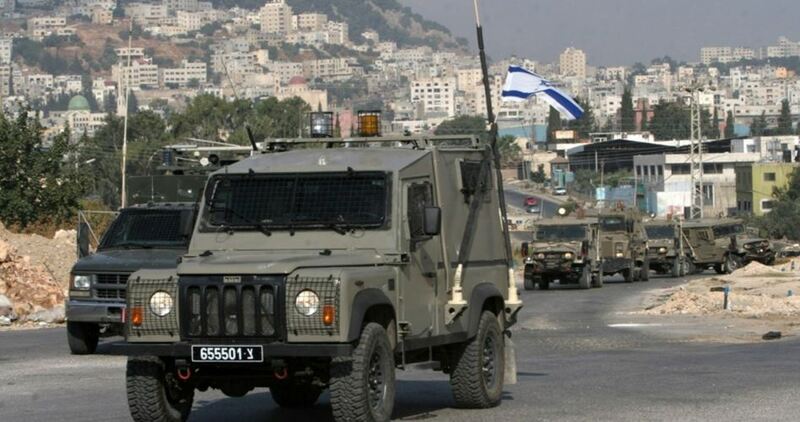 The Israeli occupation forces (IOF) on Sunday afternoon raided Jenin city and were deployed in large numbers on the Jenin-Nazareth road. Local sources told the PIC reporter that several IOF vehicles broke into a supermarket and confiscated recordings of surveillance cameras installed on the Jenin-Nazareth road. 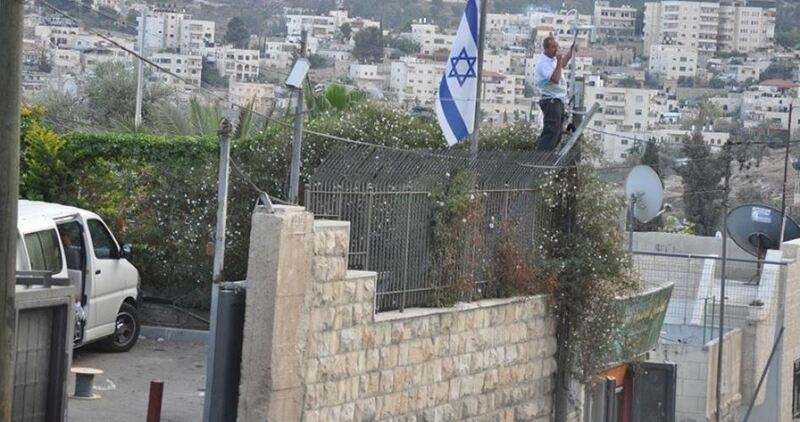 They added that the IOF soldiers later withdrew from the area with no arrests reported. The Israeli occupation's greed goes further with more Palestinian lands and sites stolen in Occupied Jerusalem. Judaization operations are in full swing in an attempt to alter the holy city's identity taking advantage of the US recognition of Jerusalem as Israel's capital. The Israeli occupation authorities are planning to take control of Ain al-Haniya, which is located in al-Walaja village south of Occupied Jerusalem, and the surrounding lands to turn them into an Israeli national park. Ain al-Haniya is one of the most important water springs in Jerusalem which flows from a rocky cave that is linked to a set of underground water channels which lead to many of the city's small waterfalls. Member of al-Walaja village council Omar Hajajleh said that Ain al-Haniya is located in a Palestinian area occupied since 1967. "We used to visit it every now and then for recreation," he added, "But after the separation wall was built around al-Walaja, taking a long bypass road became the only way to reach Ain al-Haniya." Hajajleh told the PIC reporter that the Israeli authorities intend to move al-Walaja military checkpoint to another location two kilometers away from the current one, which would deny the West Bank Palestinians access to the water spring. He noted that the authorities are also preparing for a national park project in the area. Ain al-Haniya is everything to the people of al-Walaja. It is their past, present and future. They always say, "You are never a Walaja resident until you drink from Ain al-Haniya." 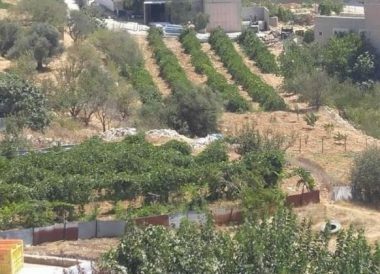 Hajajleh explained that the new checkpoint will prevent the people of al-Walaja from reaching hundreds of dunums of their lands which are planted with olive and almond trees. Ain al-Haniya is also special for the Christian community there. Some monks perform their prayers near the water spring on a regular basis. History says that the late Palestinian archaeologist Dimitri Baramki discovered during excavations he conducted in 1930s the remains of a church, water canals, ponds and mosaic floors near Ain al-Haniya. Peace Now movement said that the Israeli-controlled Jerusalem municipality is investing thousands of shekels to establish a checkpoint that prevents Palestinians from reaching Ain al-Haniya and turn it into a recreational place for Israelis only. Peace Now pointed out that in 2010, the Israeli occupation authorities completed the construction of the separation wall around al-Walaja village and isolated it from Ain al-Haniya and about 250 dunums of its agricultural lands. In 2013, Plan 12222 was approved, whereby the area surrounding Ain al-Haniya will be transformed into a national park. 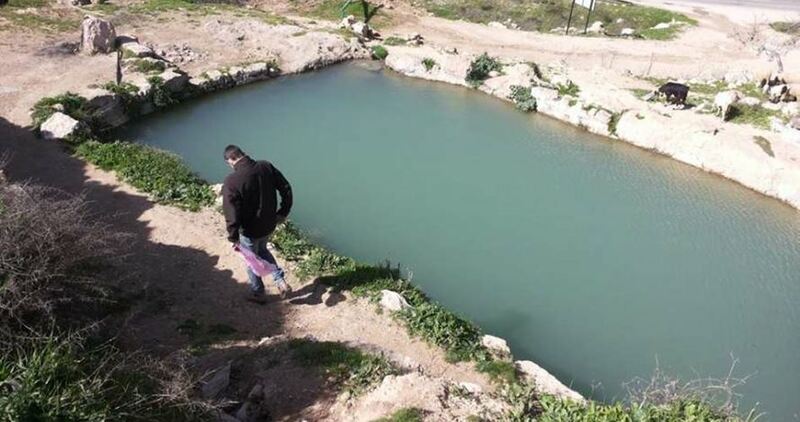 The Israeli government later invested millions of shekels in cooperation with the Jerusalem Development Authority to renovate the water spring. Following the renovation operation, it was decided to relocate the military checkpoint, so that the Palestinians no longer could reach Ain al-Haniya. On 12th February 2018, the so-called Security Committee of the Israeli war ministry approved the transfer of the checkpoint for "security purposes", but the real plan is to make Ain al-Haniya a purely Israeli site. Israel's Minister of Jerusalem Affairs Ze'ev Elkin wrote this openly on his Facebook page, "Presently our goal is to move the police checkpoint into the park to make it accessible to all residents of Jerusalem (Israelis)." Peace Now affirmed that the infrastructure work has been completed for the new checkpoint. Israeli soldiers invaded, on Friday at dawn, a home of a former political prisoner in Barta’a town, south of the northern West Bank city of Jenin, before searching it and confiscating a large sum of cash. The soldiers also detained for several hours two young men and a teenage boy, near Jenin. The Jenin office of the Palestinian Prisoners’ Society (PPS) said the soldiers invaded the home of Mohammad Nasser Alaqma, and interrogated him and his family, before illegally confiscating 10000 Shekels from the property. It added that the soldiers invaded Kafrit village, southwest of Jenin, detained two young men, identified as Mohammad Salim and Laith Salem Abu Bakr, and released them after interrogating them for several hours. The soldiers also detained a teenage boy, identified as Yousef Mahmoud ‘Obeid, from Sielet al-Harithiya town, northwest of Jenin, and interrogated him for a few hours for “standing near the Annexation Wall,” on town’s land, but later handed him to the Palestinian District Coordination Office. The Israeli occupation forces (IOF) kidnapped five Palestinians during West Bank campaigns at dawn Friday. Israel radio claimed that the five detainees were wanted for interrogation over anti-Israel activities. 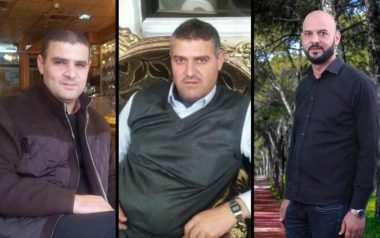 Wafa news agency reported that the IOF raided the house of the Palestinian citizen Sulaiman Hroub in Deir Sammit town southwest of al-Khalil, searched it, arrested his three sons Samih, Mohammed and Mousa and transferred them to an unknown destination. Hroub family said that the IOF broke into their jewelry shops in al-Khalil city and confiscated about 40 kilograms of silver. Palestinian activist Mohammed Awad said that the IOF arrested ex-prisoner Khattab Abu Maryya, 16, after raiding and searching his family house in Beit Ummar town north of al-Khalil. Meanwhile, the PIC reporter said, quoting local sources, that the IOF arrested the Palestinian youth Ameer Abu Hamed, 26, after raiding his family house in Qalqilya city and wreaking havoc on it. 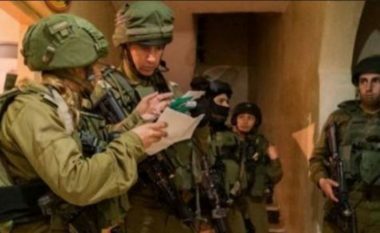 The IOF further raided Azzun town east of Qalqilya, closed its entrances, assaulted residents and searched a number of houses. The Israeli occupation forces (IOF) on Thursday notified the prisoner Ahmad Jamal Qunbu’s father about their intention to demolish his family home. Jamal Qunbu, Ahmad’s father, affirmed that Israeli forces handed him a notification informing him that they will demolish his home on April 17 in retaliation for Ahmad’s alleged partaking in the fatal shooting of an Israeli settler near Nablus in early January. The father said he had appealed to the Supreme Israeli Court through his son’s attorney to annul the decision but all in vain. Israeli authorities have accused Ahmad Jamal Qunbu of assisting deceased Ahmad Nasr Jarrar in the killing of the Israeli settler outside Havat Gilad illegal settlement, to the west of Nablus in the West Bank. Three houses belonging to Ahmed Nasr Jarar’s family were earlier demolished. 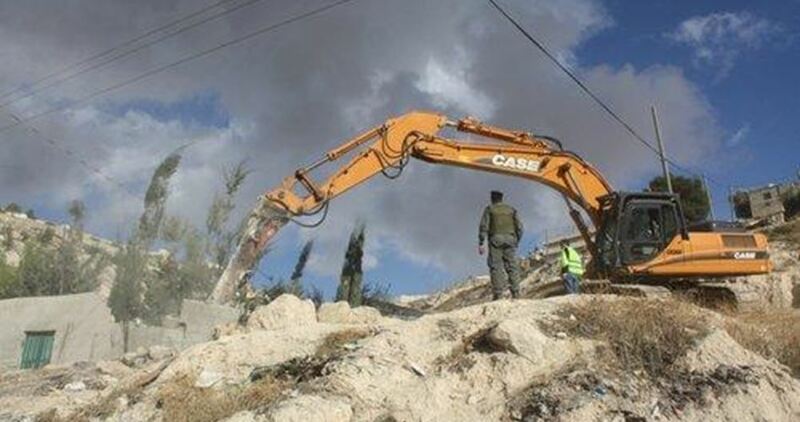 The Israeli Occupation Forces (IOF) Thursday stormed along with a number of bulldozers Shaqba town west of Ramallah and demolished a number of Palestinian-owned facilities. 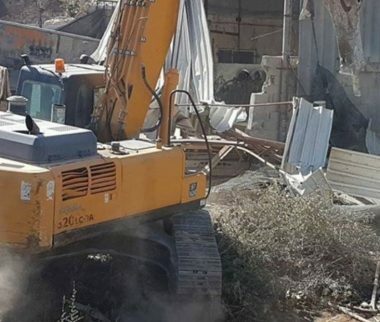 Head of the village council Adnan Shelsh affirmed that Israeli military bulldozers demolished a house under construction along with two agricultural rooms and retaining walls in the town. Israeli authorities claimed that the demolished facilities are located in Israeli-controlled Area C.
Violent clashes erupted following the incident. At least three rubber bullet wounds and a number of inhalation cases were reported during the confrontations. 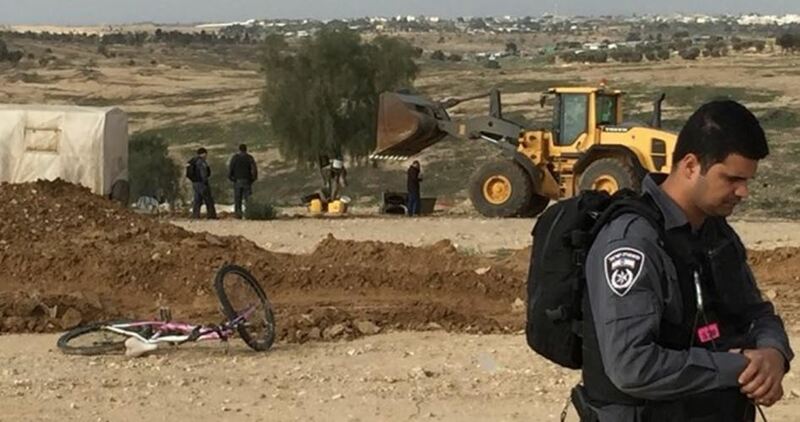 Israeli police demolished at dawn Wednesday two Palestinian-owned houses in Abu Ghush town, west of occupied Jerusalem. 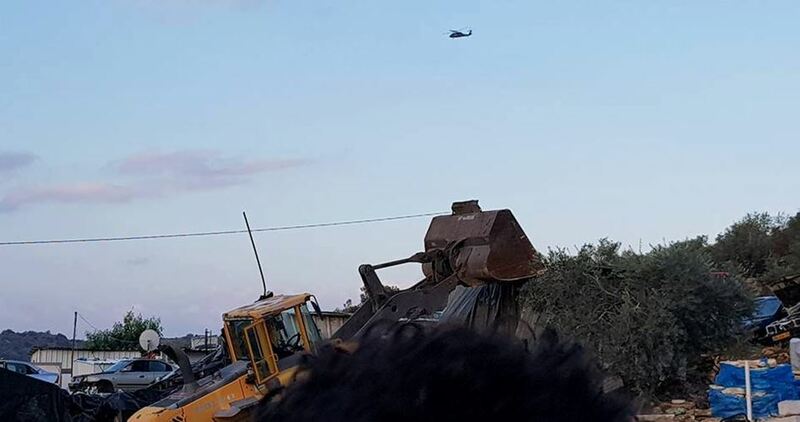 Palestinian sources affirmed that Israeli bulldozers, accompanied with Israeli forces, stormed the town early today and surrounded two local houses. The houses were evacuated before being demolished under the pretext of being built without Israeli municipality’s permit. 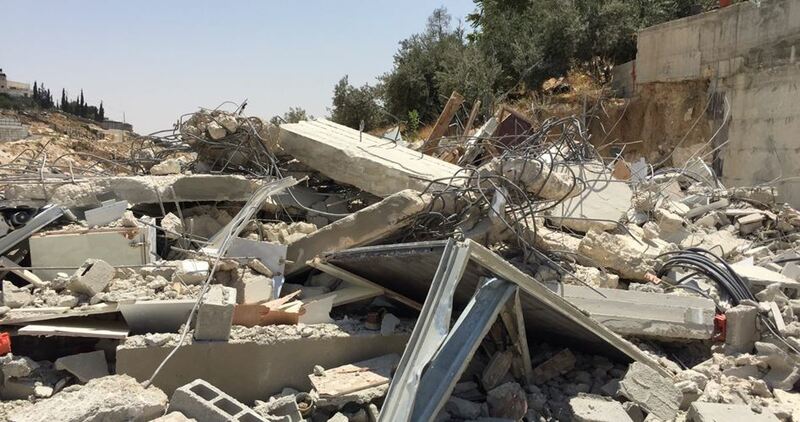 Last month, three Jerusalemite houses were demolished while two Palestinians were forced to demolish their houses by their own hands in the occupied city. Israeli forces demolished Monday night a primary school in Zanouta town, to the south of al-Khalil, just one month after it had been inaugurated by the Palestinian Education Ministry. Israeli forces demolished Zanouta school near al-Dahriyeh, in the southern occupied West Bank, and imposed a tight cordon in its vicinities. The school, which comprises six classrooms, was built from cement blocks and metal plates and provides services for 43 students, including 10 children in kindergarten. The Directorate of Education and Higher Education south of al-Khalil slammed the arbitrary demolition, saying the school was inaugurated on March 25 along with other schools built to provide education for children in communities endangered by Israeli military measures. Civil society representatives announced their intent to rebuild the school on Tuesday as a means to face up to such Israeli measures. Israeli soldiers demolished, Tuesday, an under-construction Palestinian home in Jibiya Village, north of the central West Bank city of Ramallah. Media sources in Ramallah said several army jeeps, and bulldozers, invaded the village during early morning hours, and surrounded the property. They added that the soldiers then demolished the under-construction home of Hijazi Mahmoud, in the al-Qastal area, allegedly for being built without a permit from the “Civil Administration Office” run by the army in the occupied West Bank. It is worth mentioning that the home is in an area which is subject to frequent Israeli violations, especially since Israel intends to expand illegal colonies, built on Palestinian lands. The Israeli occupation authorities on Sunday evacuated a Palestinian home, belonging to the Ruwaidi family, in Occupied Jerusalem. Israeli forces cordoned off the access roads to Jerusalem’s Silwan town, south of holy al-Aqsa Mosque, before they blocked Palestinians’ access to the targeted home. The move comes as part of a series of abrupt home evacuations carried out by the Israeli authorities and forces across occupied Jerusalem in favor of illegal settlement expansion. The Israeli “Civil Administration Office,” run by the Israeli army in the occupied West Bank, issued a military order for the illegal annexation of half a Dunam of Palestinian agricultural land, in Beit Ummar, north of the southern West Bank city of Hebron. The soldiers confiscated half a Dunam of land (0.12 Acres) in Sider az-Zeitouna area, in the opposite direction of a military tower which was installed by the army at the main entrance of the town. The confiscation order states that the army will use the land for “security considerations,” and to “installed a power transformer,” to provide electricity for the military observation tower. The lands are privately owned by Ahmad and Mahmoud Younis Abu Ayyash, from Beit Ummar town. Three years ago, the army illegally confiscated 200 meters of the same land to expand the “security zone” of the military tower. The land in questions has been off-limits to the Palestinians, who have been denied access to it, even to plant it, since the year 2001. Israeli soldiers abducted, on Monday at dawn, six Palestinian children from their homes in occupied East Jerusalem, in addition to abducting a young man in Bethlehem, three in Nablus, and one in Qalqilia, the Palestinian Prisoners’ Society (PPS) has reported. 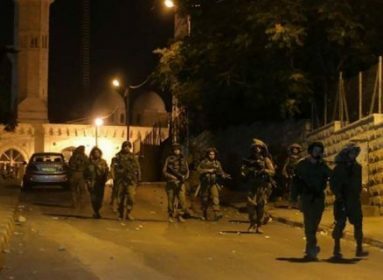 The PPS said that dozens of soldiers invaded the al-‘Isawiya town, in the center of Jerusalem, searched and ransacked many homes and abducted six Palestinians, before moving them to interrogation centers in the city. The children have been identified as Mahmoud Ashraf Obeid, 13, Younes Sofian Obeid, 15, Rida Mohammad Obeid, 17, Saleh Fakhouri, 13, Ismael Ali ‘Aassi, 13, and Ali Amjad ‘Atiya, 13. It is worth mentioning that the town has been subject to daily invasions for more than a year, in addition to a strict military siege over the past two months. Also in Jerusalem, the soldiers stationed at the Chain Gate, leading to the Al-Aqsa Mosque, prevented one of the holy site’s guards, identified as Mohammad Badran, from entering it. Furthermore, the soldiers invaded Beit Fajjar town, south of Bethlehem, violently searched homes and abducted Mahmoud Mohammad Thawabta, 25. In Nablus, in northern West Bank, several army jeeps invaded Ras al-Ein and Rafidia, searched many homes and abducted Khaled Ala Tawil, 20, Mohammad al-Kawni, 23, and Hamza Khweira, 24. The soldiers also invaded the home of Abdul-Rahman Bani Fadel, in Aqraba village, and handed his family a demolition order to their property. The army claims that Bani Fadel carried out a deliberate attack, last month, killing one Israeli security guard, before he was shot dead by Israeli soldiers. In Qalqilia, also in northern West Bank, the soldiers abducted Mohammad Ali Sweilem, 22, while crossing a sudden military roadblock, east of the city. The Palestinian was heading to his college, Palestine Technical University – Kadoorie, and his father is a political prisoner, serving a life term in Israeli prisons. In Hebron, in southern West Bank, the soldiers invaded and searched many homes, and reportedly confiscated a weapon. A Palestinian report has revealed that the Israeli occupation authority (IOA) started to carry out a major railway project aimed at linking its illegal settlements in the West Bank with the 1948 occupied territory (Israel). According to a report released recently by the National Bureau for Defending Land, the railway project will first link all West Bank settlements with each other and then link them all with cities in Israel. 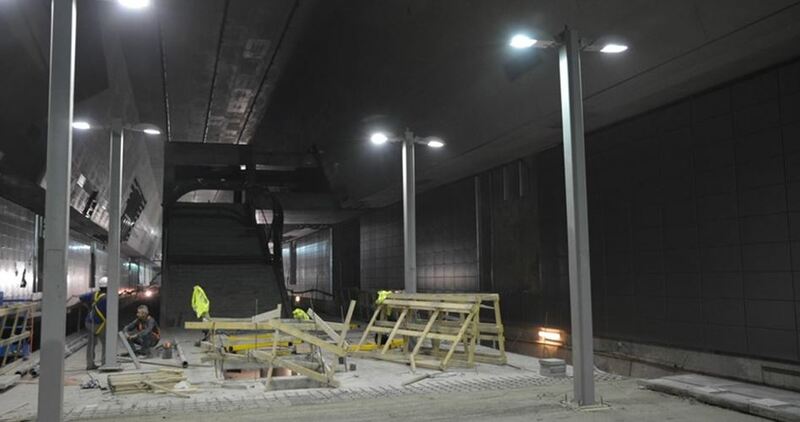 The project is expected to be completed in 2025. The IOA already seized about 2,000 dunums of Palestinian land for the project, especially in the West Bank villages of Zawiya, Mas-ha, Biddya, Sarta, Kafr ad-Dik and Bruqin. The project, which includes 11 railway lines and 30 passenger stations, will lead to the destruction of vast tracts of agricultural land and water resources in the annexed Palestinian areas.